The standard wedding programs are no more working for the couple of the recent time. The destination wedding or elopements are quite common wedding styles in the recent time. With more and more experimenting happing with the wedding style, the touch of uniqueness is there on the wedding reception parties too. In most of the cases in the modern wedding style, the well-wishers are unable to attend the wedding parties which are of uncommon style so post-wedding reception parties are thrown for them. 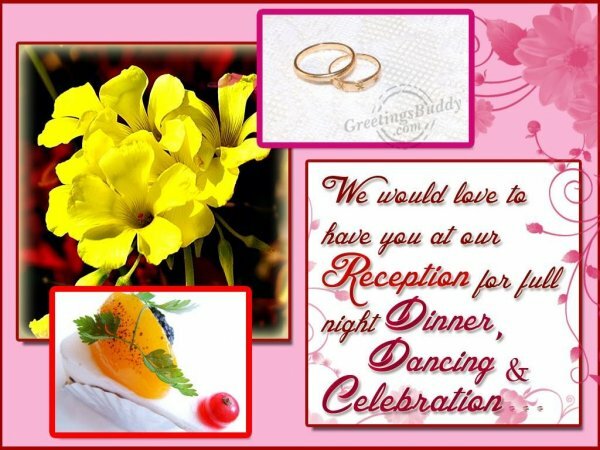 When the couple decide to have a reception party, proper invitation has to be arranged for the invitees so that they can come and enjoy the reception party well. The location, day and date and time of the reception party must be mentioned clearly on the invitation card and there should not be any mistake regarding the names of the couples. If the place is not very familiar with the guests, please do mention the direction very well in the reception card. Once has to be careful about the wordings of the reception invitations. Go through the online reception card templates to save your time and money. You can select the reception card as per the theme of the wedding. To give the invitation a very personal touch, you can use the photographs for inviting the guests. One has to be careful enough while inviting the guests for the reception so that no well-wisher is left out and the invitation must be made well before to allow them to arrange their engagements.